Posted on August 25, 2016 by Barry V.
According to my Mass Audubon Sanctuary Guide (2015 edition), Ipswich River Wildlife Sanctuary is the largest of the Mass Audubon properties, comprising 2,267 acres. One has to keep in mind, however, that wetland communities cover approximately 70% of the sanctuary, thus a huge portion of the property is underwater at any given time! 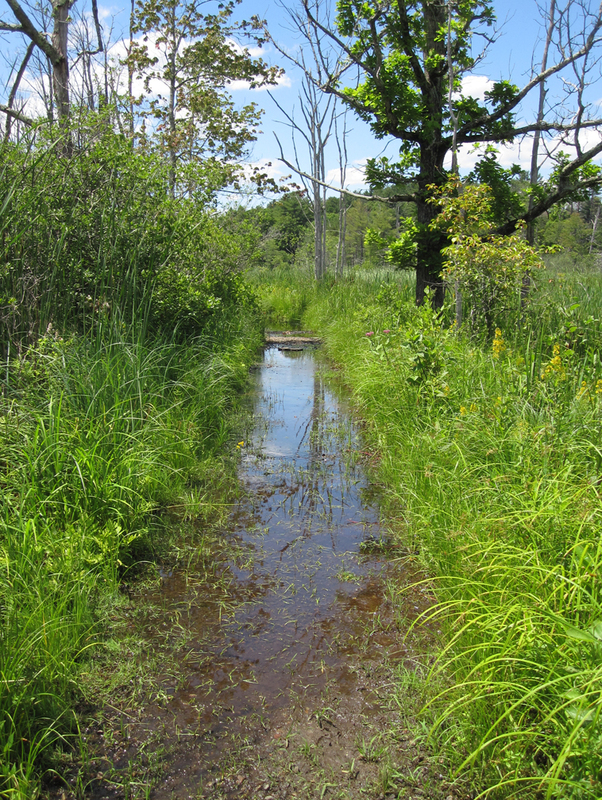 The trails traverse a series of drumlins, eskers and other areas of higher ground left behind by the glaciers, and these are woven in and around the extensive wetlands. Boardwalks have been built to enhance access to some areas, but beaver activity causes water levels to fluctuate from year to year, and a few trails were impassable on the day I visited. It’s not an uncommon situation. With twelve miles of trails and only one day to explore them all, I knew I’d need to plan carefully to maximize my time at the sanctuary. Luckily, I meet Scott Santino in the parking lot. Scott is the staff naturalist, and he generously goes over the trail map with me, pointing out areas of special interest, places where I might encounter various species, and warning me of flooded trails. 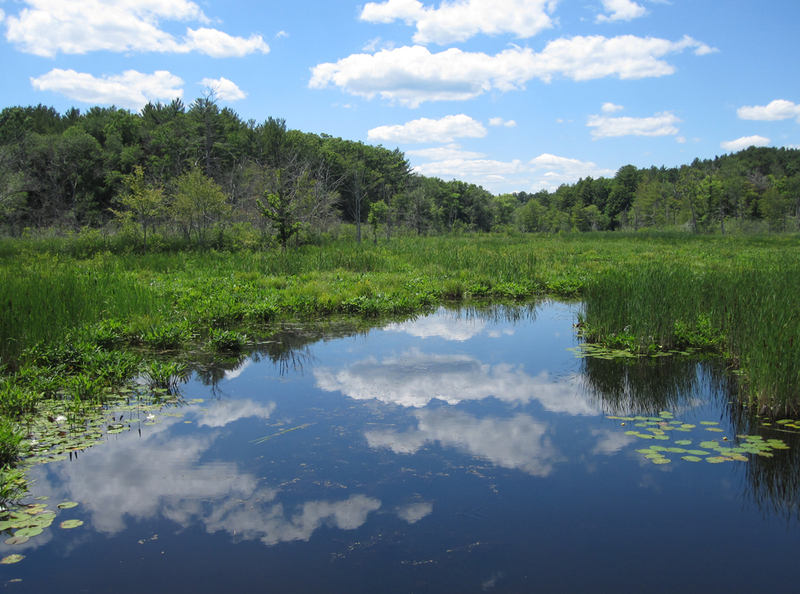 First, I head to Bunker Meadows – a huge buttonbush swamp adjacent to the Ipswich River and Canoe Launch Area. 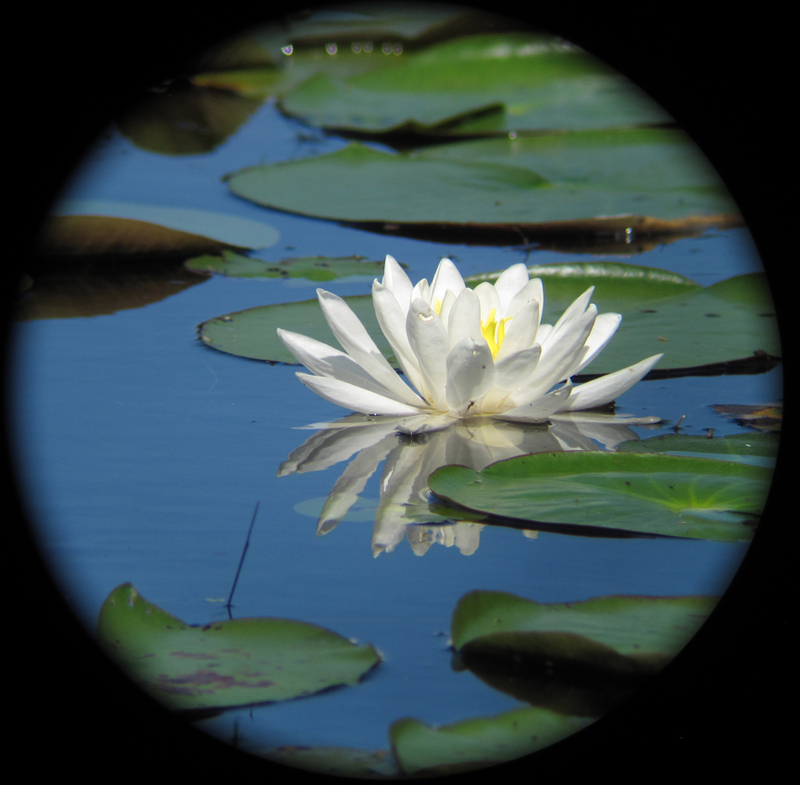 The pond lilies here are a sight to behold – forming huge floating carpets of pink and white on any areas of open water. A bullfrog near the canoe launch looks to be a good model, and reminds me that I have not yet painted a frog for this residency project. 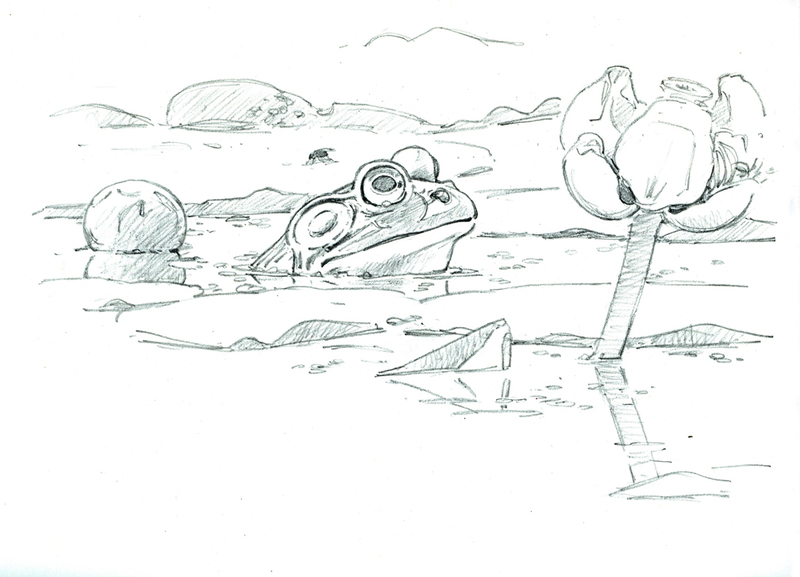 I start a drawing on hot-press paper, re-arranging the frog’s head, the lily pads and a spatterdock blossom to create a more interesting composition. Care must be taken to maintain SCALE when you move elements around like this! Scott had explained how changing water levels in recent years have led to many dead silver maples in the floodplain of the river, and these are making the area more attractive to certain birds, especially cavity nesters like tree swallows, bluebirds and great-crested flycatchers. Indeed great crested flycatchers are abundant along the Ipswich River Trail. Wood pewees, warbling vireos, gnatcatchers and kingbirds are also in evidence here – and in the surrounding marsh the clattering calls of marsh wrens come from all directions, though they offer me only brief glimpses among the cattails and buttonbush. The Drumlin Trail passes through mature forest, where I hear a scarlet tanager, orioles and more flycatchers. Whenever I pause along the trail, I notice an interesting phenomenon: small birds (mostly titmice and chickadees) approach me closely, coming to within an arm’s length. Odd! As I near the Stone Bridge Area, I encounter the Waterfowl Pond Trail, now flooded by beaver activity. Evidence of the sanctuary’s early history as an arboretum can be found here. 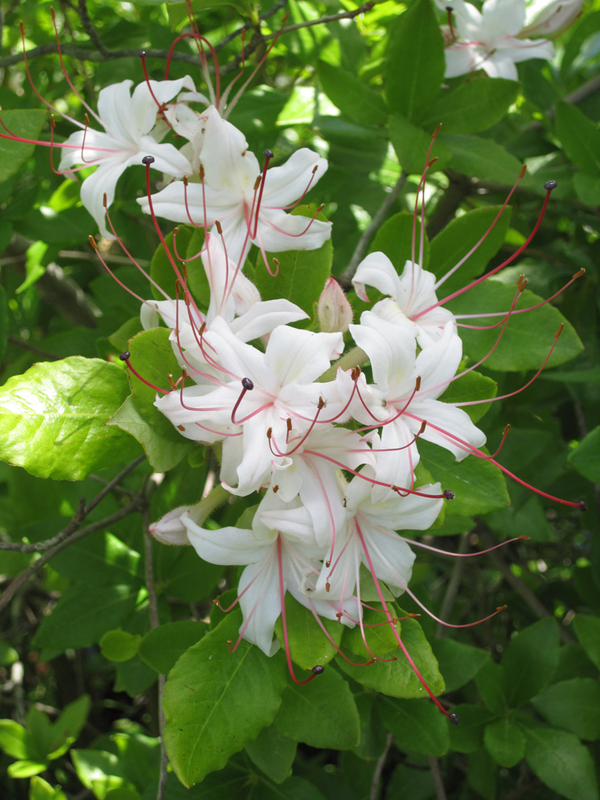 Growing along the trail are garden loosetrife (L. vulgaris) and smooth azalea (R. arborescens) – both in glorious bloom. The view from the handsome old Stone Bridge is restful and sublime, as are the views of Hassocky Meadow from the elevated North Esker Trail. 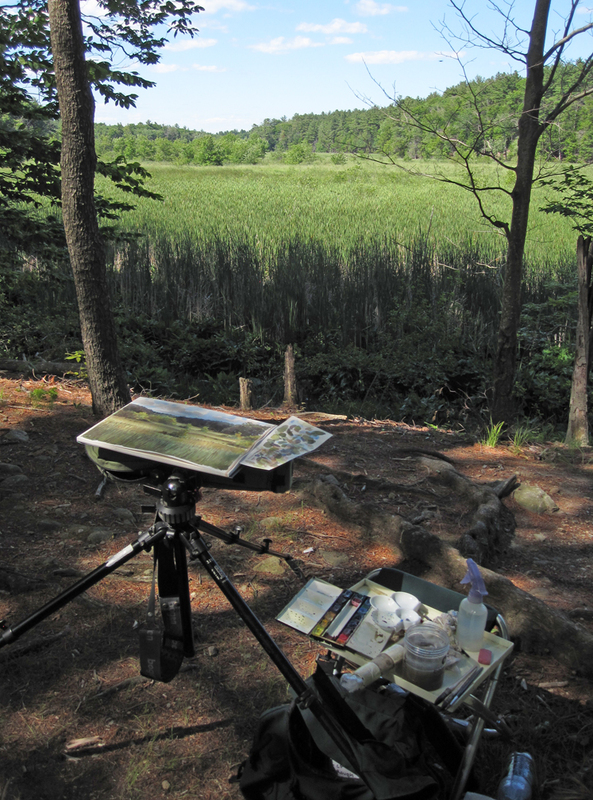 Atop the esker, I set-up my kit to paint a landscape of this large cattail marsh, with Averill’s Island as a backdrop. 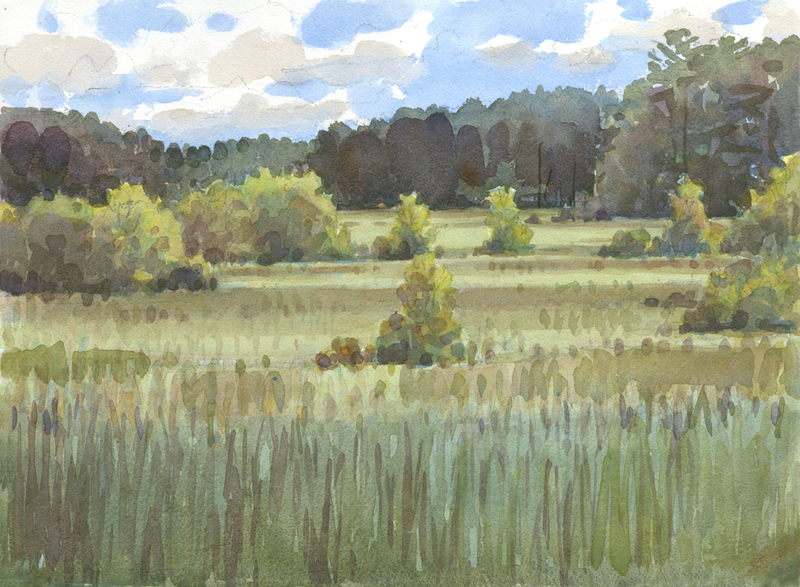 As I’ve discussed previously in this blog, the greens of high summer in New England can pose a challenge for the landscape painter – how to add some variety and interest to all that unrelenting GREEN? Today, the clouds cast sweeping shadows across the scene, adding dark accents to the distant pines. 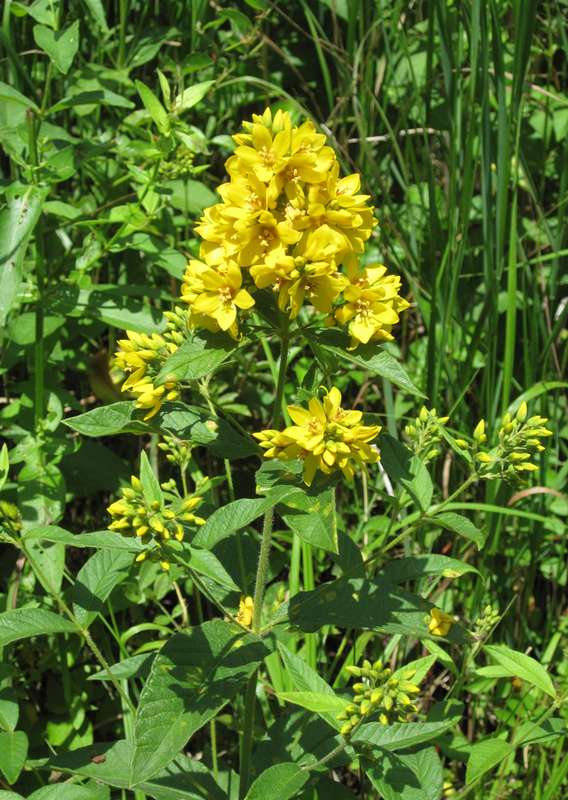 Additionally, the shrubs in the marsh are a warmer yellow- green, supplying some variety and color contrast. I urge my workshop students to pay special attention to the temperature of the greens in their landscape painting – placing the cooler (bluish) greens in the distance and warmer (yellowish) greens in the foreground to create a feeling of space and depth. At Hassocky Meadow, I break this general rule. I paint the band of cattails in the near foreground a decidedly COOL green, and somehow it seems to work. “Rules” in art are never hard and fast! As I’m painting, a white-breasted nuthatch approaches closely on a nearby tree trunk, inspecting me with a curious expression. This happens at least three times while I work on my landscape, and I’m beginning to fancy that through some mysterious telepathy, the birds recognize me as a kindred spirit! Much later, back in the parking lot, I relate these “close encounters” to a regular visitor, and she laughs, explaining that Ipswich River Wildlife Sanctuary is well known to locals as a place where the birds have become habituated to taking hand-outs of food from visitors! So much for my communion with the birds! This entry was posted in Barry Van Dusen Residency and tagged Ipswich River Wildlife Sanctuary on August 25, 2016 by Barry V..